There is a place on the South Coast of England around Lyme Regis and Charmouth where there are hundreds of fossils of dinosaurs. Many of these are incredibly small anemonites, but some other major finds have happened. Rocks can tell us so much about the earth, about how they formed and even where they may have come from. In a sense, rocks point to creation, and to their Creator - God. Luke 19.37-40 - When he came near the place where the road goes down the Mount of Olives, the whole crowd of disciples began joyfully to praise God in loud voices for all the miracles they had seen: Blessed is the king who comes in the name of the Lord! Peace in heaven and glory in the highest. Some of the Pharisees in the crowd said to Jesus, "Teacher, rebuke your disciples!" "I tell you," he replied, "if they kept quiet, the stones will cry out." 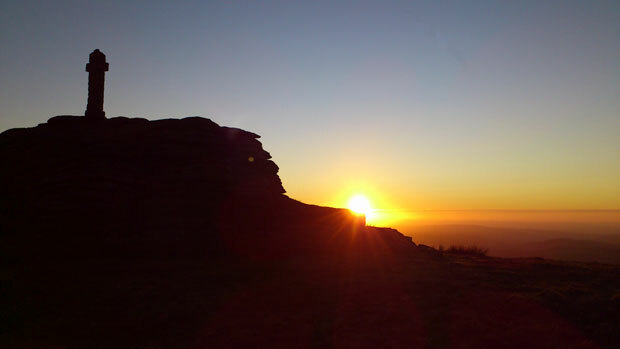 The picture below was taken on Dartmoor in England, just around the time of sunset. It shows the top of a tor (granite rock), with a stone cross on it. In a sense, this picture is a great summary of what we are looking at in relation to God and rocks. Here is a rock, standing tall above the hills of Devon (and into Cornwall). The sun is shining on the rock - the light of God's presence shining and glowing, bringing colour to the skies and the landscape. The stone cross is a place that stands the tallest of all, a symbol of praise to God the creator. Simply by its presence it brings glory to God - in this case the rocks, the stone cross is crying out its worship to God in heaven! show me your face, let me hear your voice; for your voice is sweet and your face is lovely. A Prayer: Lord, thank you that all creation sings and cries out to you in praise! Your Word tells us that creation longs for the day of your return when creation will be put right. But until that time Lord, I join with creation in singing your praise. I see your glory in the rocks, in the stones and they tell of you, the Creator God. I pray that people would see your creation and come to know you as the one true God. Amen!